‘Having someone standing in front of girls saying, ‘If I can do it, then you can too’, gives a strong message of hope- Mat Wright for the British Council. The future of women at the workplace is largely determined by their STEEM skills. Most in demand & high paying jobs today are Science & Tech based but mainly dominated by the males. Women can also be prepared ahead for this as well. 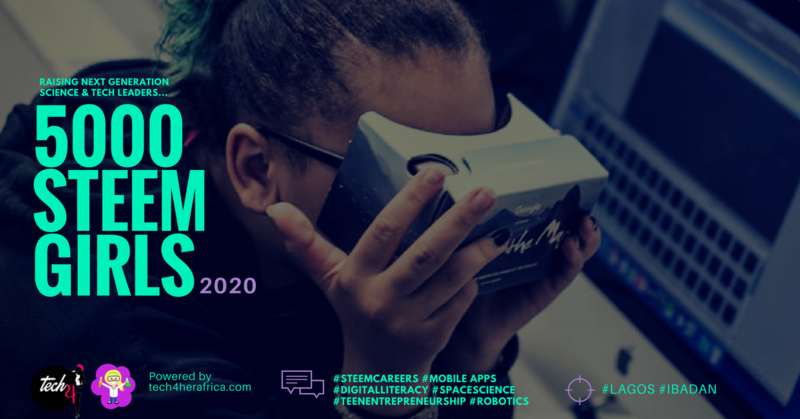 STEEM Diva is an initiative by Tech4Her Africa (based in 6 countries in Africa) to engage over 5,000,000 women actively taking up careers in Science & Technology by 2030. The most effective way to achieve this is to attract them at the early stage. We are reaching out to the junior college girls so they can be inspired to choose STEEM subjects as part of their post secondary goals. STEEM Diva is a concept that’ll accelerate interests and improve the performances of girls in especially Science and Technology fields. They will also experience how science and tech fields practically applies to solving the problems we face in our communities. STEEM Diva Ambassadors: In many societies a girl’s choice to study science can be understood as a decision that weakens her identity as a female and making her appear less feminine. This dissuades many girls from studying STEEM subjects in favour of courses that are considered more appropriate for their gender. By the end of the program, we will have mentored girls recognised as ambassadors to inspire others in their schools and communities. Access To Mentoring & Support: When trying to encourage young women to do STEM subjects, it is not enough to tell them that they can do it. Introducing girls to inspiring women who are experts in these fields can be powerful. More Girls Choosing Science/Tech Subjects at Senior Classes: We have a designed a framwork that ensures that these junior girls are inspired to choose STEEM subjects at Senior school and as well at university level. Scholarships to study STEEM careers in the university and after- school internships will be available to dedicated paricipants. Encourage Innovation & Creativity: Science and Technology skills are very essential for innovation. Digital Literacy & Empowerment: Digital education is the foundation & platform for engaging the STEEM components. Re-inventing how girls learn via digital tools and making learning more interesting. We’ll be delivering and interacting via digital tools. Explore More Career Opportunities: Girls can now be bold to explore other career opportunities to complement their new and competent skills.